The construction of the second branch of the Nord Stream-2 pipeline, lobbied by the Russian gas monopoly Gazprom, can become Russia’s "Trojan horse" for the European Union, according to Naftogaz CEO Andriy Kobolev who spoke at the "Nord Stream 2 - Energy Union at the Crossroads" conference held in the European Parliament this week. 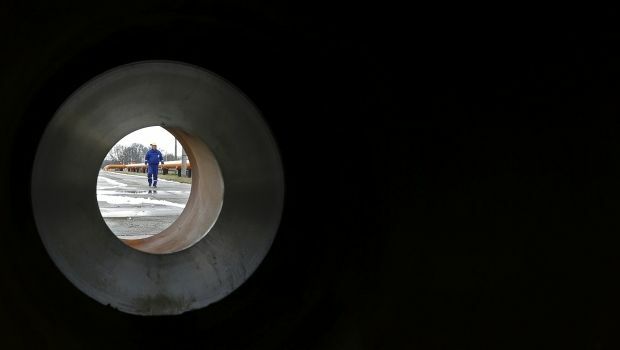 "Like the Trojan Horse, the Nord Stream 2 is wrapped as a gift but is designed to weaken the EU from within," said Kobolyev, according to Naftogaz press service. Read alsoNaftogaz looking for money to buy gas for next winter“This change of gas market landscape will create new opportunities for Gazprom to abuse its dominant market position and harm energy security in the EU. Most countries of Central, Eastern and Southern Europe heavily depend on Russian gas and have limited or no alternative sources of gas supply. If Nord Stream 2 is built, their bargaining position against Gazprom will further deteriorate,” Naftogaz CEO said. "Ukraine operated in the "gas for loyalty" conditions for many years. In the result, we were charged some of the highest gas prices in Europe and were limited in our policy choices. Our results in the past two years demonstrate that diversification of suppliers and improving interconnectivity with neighboring markets are much more reasonable, both politically and financially. We are surprised to see the EU considering the opposite strategy with the Nord Stream 2 project", said Naftogaz CEO. Read alsoUkraine, Slovakia oppose Nord Stream 2 projectAs UNIAN reported earlier, at the beginning of September 2015, the Russian Gazprom, together with Shell, OMV, E. On., signed a shareholders agreement for a joint project company to construct a Nord Stream-2 pipeline. In October, Russian President Vladimir Putin personally gave a start to the construction of the gas pipeline Ukhta - Torzhok-2, which will ensure the flow of gas through Nord Stream-2 for gas supplies from Russia to the European Union, bypassing Ukraine. Read alsoAustria Vice-Chancellor affirms his country interest in Nord Stream 2 project – mediaUkrainian Prime Minister Arseniy Yatsenyuk noted that if Russia and some Western companies do build the Nord Stream-2, it would deprive Ukraine of $2 billion in profits, Slovakia – $0.8 billion, and Poland – 0.4 billion. It would also deprive the EU of actual energy independence, Yatsenyuk said.